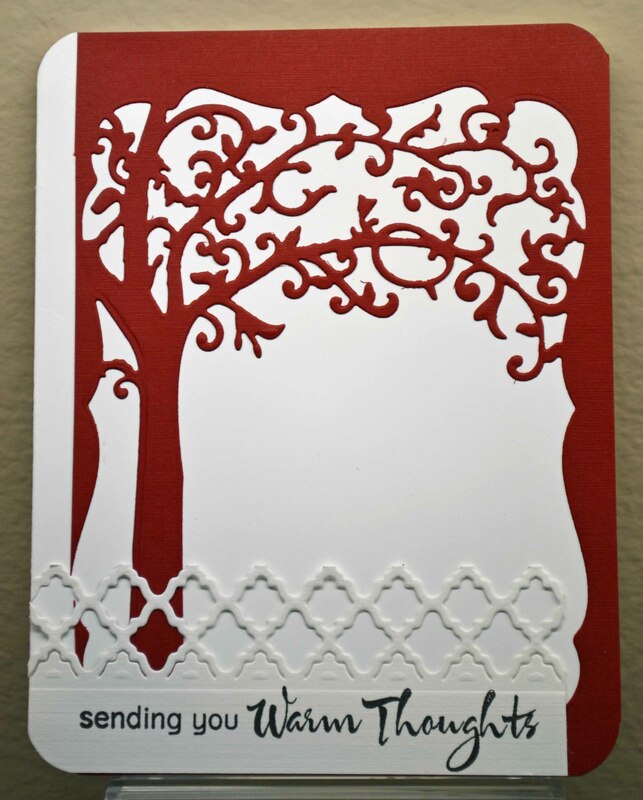 Nothing Lovlier Than a Tree…. 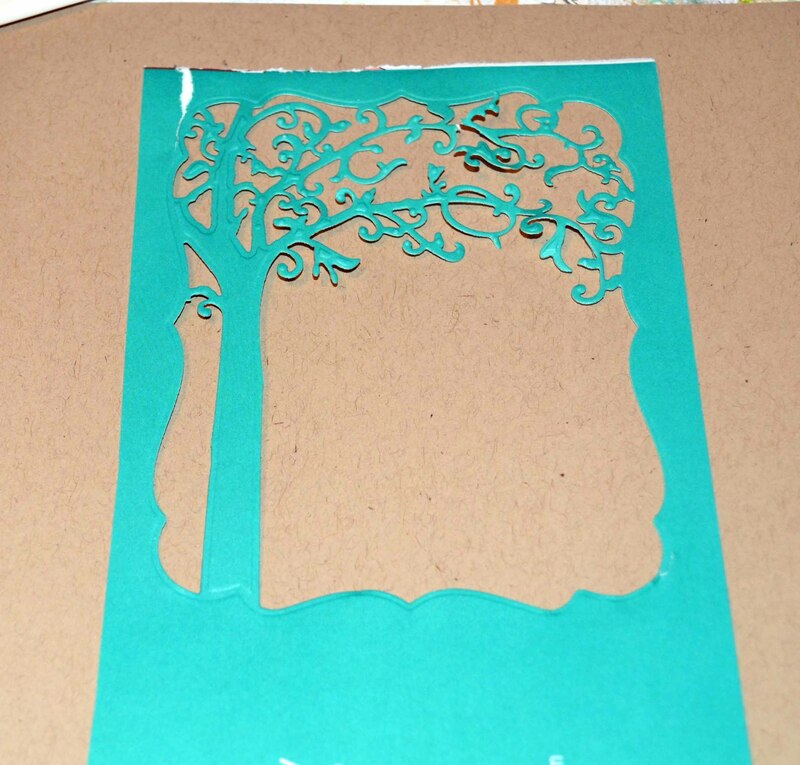 To paraphrase poet Joyce Kilmer, there is nothing lovelier than a tree, which is why I went ga-ga over this beautiful Spellbinders die (Just Swingin’) set that includes a tree silhouette as well as a swing, etc. This one I really messed up on the edges, but I trimmed a bit, added a piece of border and a sentiment and maybe saved it…? The next one was the actually the first that I cut, and you can see that I just made a mess of it. It was my practice shot. I didn’t leave enough room on the edge, the paper ripped, the colors barely work together… oh, it is sad. But what the heck. I trimmed a bit, layered a bit, and stuck on a butterfly to hide the flaw. 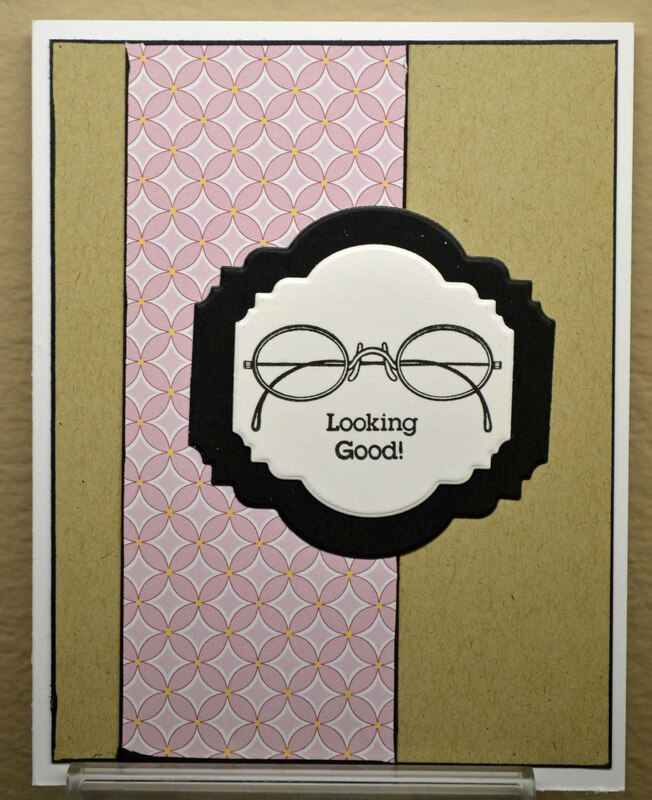 Thanks for stopping by…and for not judging too harshly! 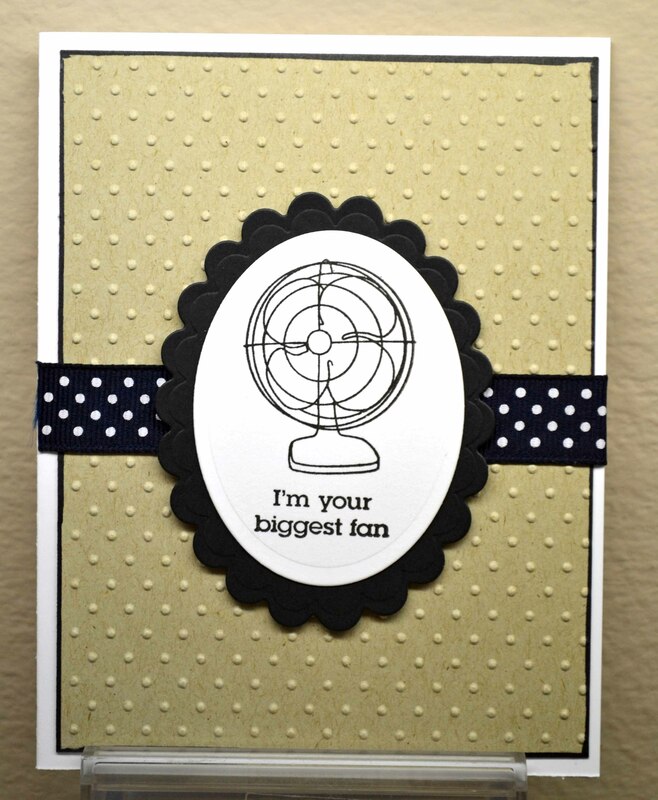 I can’t believe summer is halfway over and I have not posted these cards yet! I am off to CHA — the big craft show in Las Vegas. 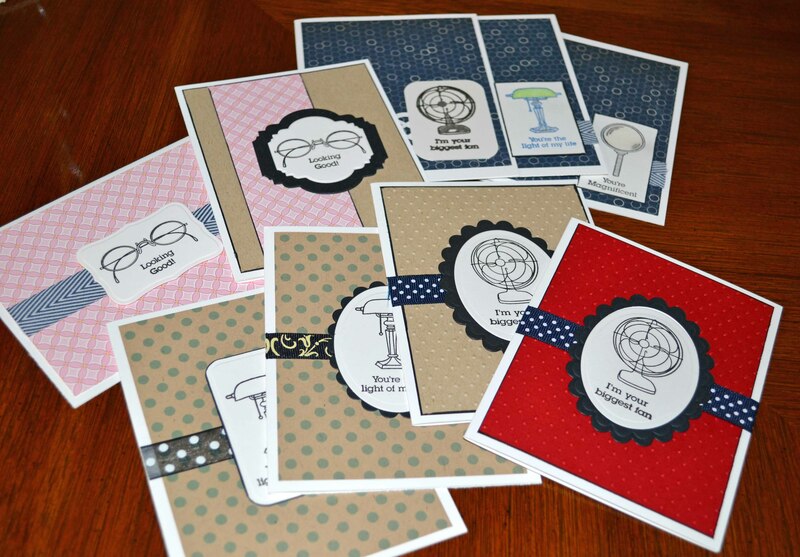 I’ll be reporting on the show for Crafts ‘n things magazine’s blog beginning in August. Thanks for stopping by! As we all know by now, I am a scrap hoarder. I haven’t met a scrap I don’t like (or try to keep.) They sit on my desk, sometimes for what seems like decades, because I KNOW I will use them … eventually. Well, THAT spoke to me! 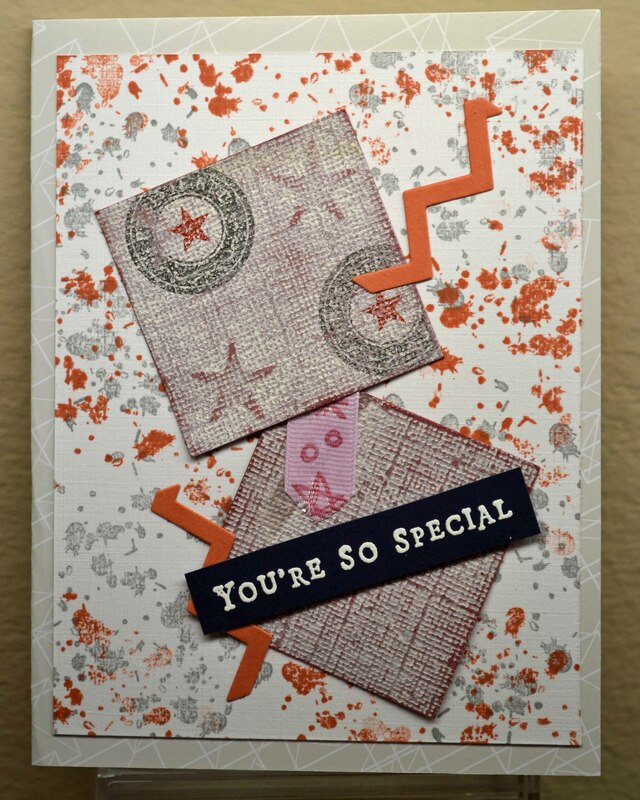 The premise is that you just toss things together, and somehow, if the paper gods are smiling, you actually have a cute card. Let’s see if it worked. 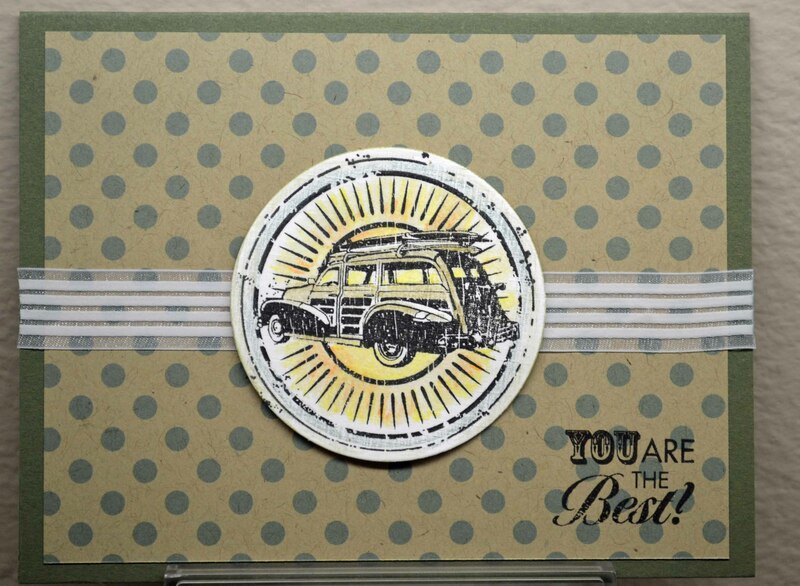 Here, the background was stamped using an old splatter stamp from Endless Creations, in ColorBox Butter and Hero Arts Wet Cement. Then I just grabbed pieces. (Recognize the happy birthday paper?) Gee, surprise, I found a use for a rosette. The special wishes image (Hero Arts) was one stamped a while ago for another project, but I never could find something else to use it on. The embellies are from the Robin’s Nest. 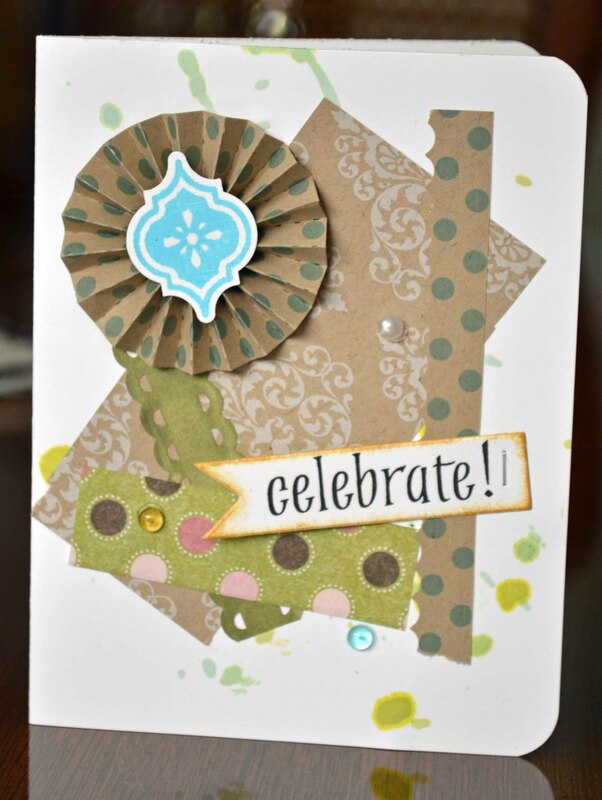 Splotches stamped using Marvy Matchables Terra Cotta and #12 grey. 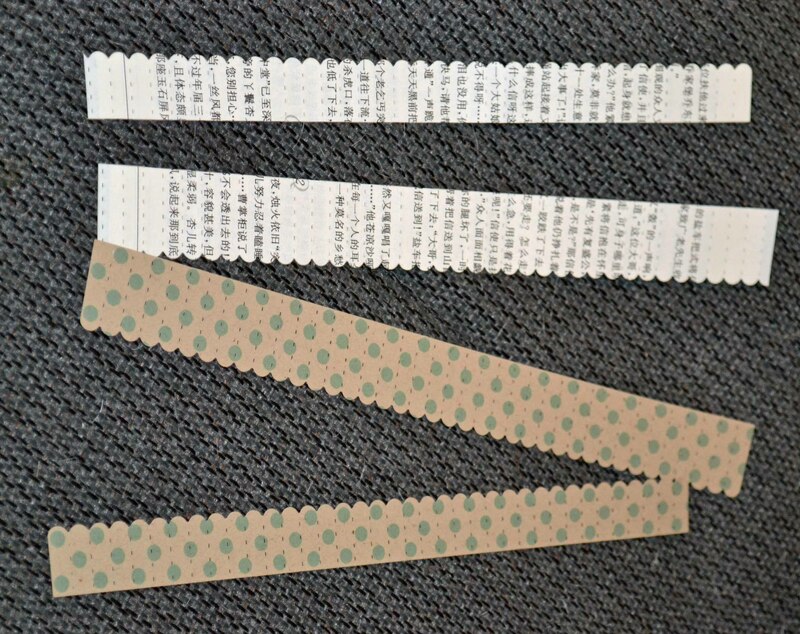 Pieces are from a Core’dinations sampler. Sentiment from Hero Arts. Not crazy about this one. 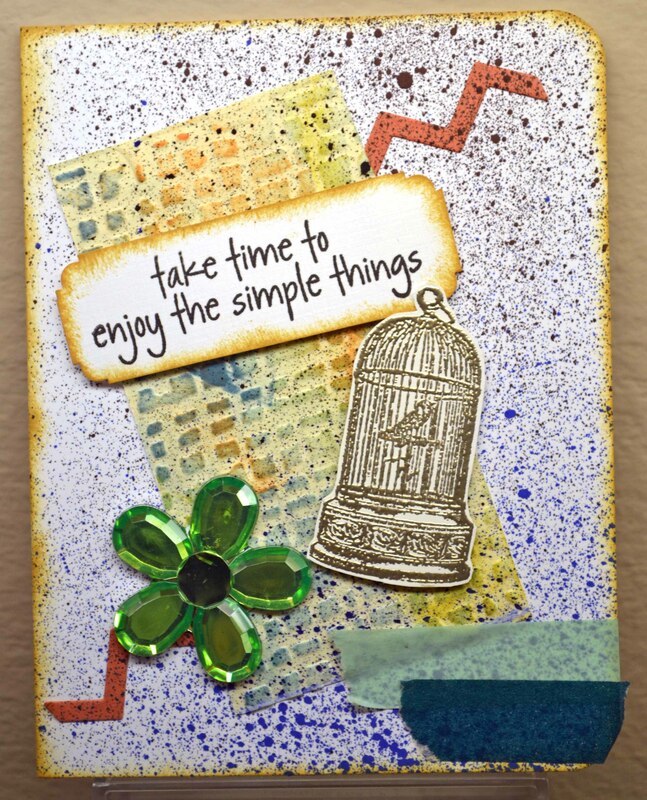 It started with the dry embossed piece (Tim Holtz embossing folder colored with sponged on Distress Inks) and the bird cage (Hero Arts?, embossed in Stampendous! PearLustre). But then I decided it needed a background. So I sprayed ColorBox’s Stephanie Barnard Blueberry and Chocolate inks). And it was truly awful. So I just kept adding things. Not sure it’s much better, but I decided to include it anyway. Thanks for not laughing. 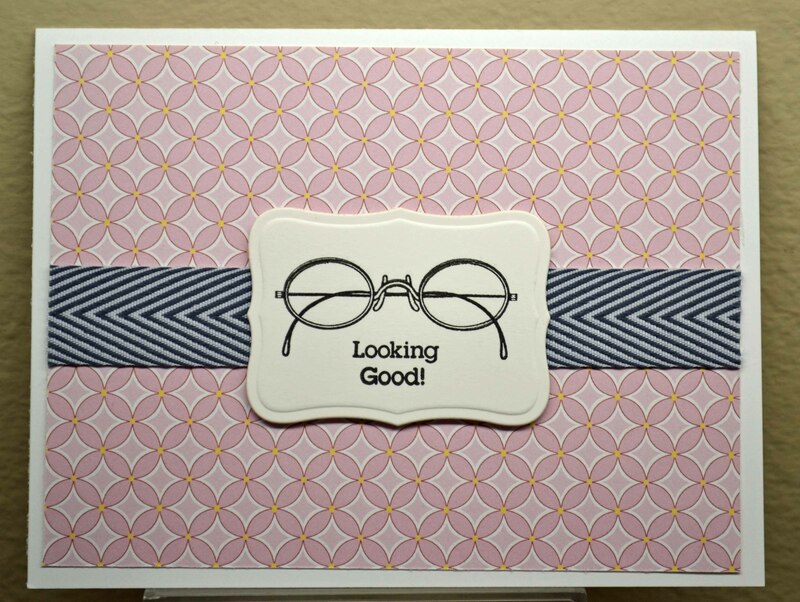 I love making cards, sending cards and giving cards as gift sets. So this set, Puns of Praise C1538 from Close To My Heart, is a perfect fit! I love the small, simple images and if I want to use the image without the “pun” underneath, it’s easy enough to mask off that part. 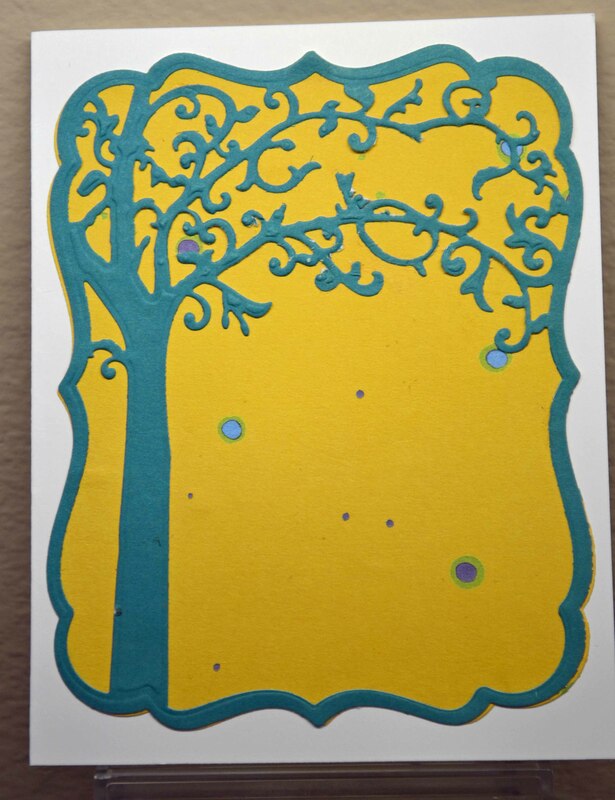 Both are pretty much the same, but using a different colored cardstock for the back layers offers a bit of a change. 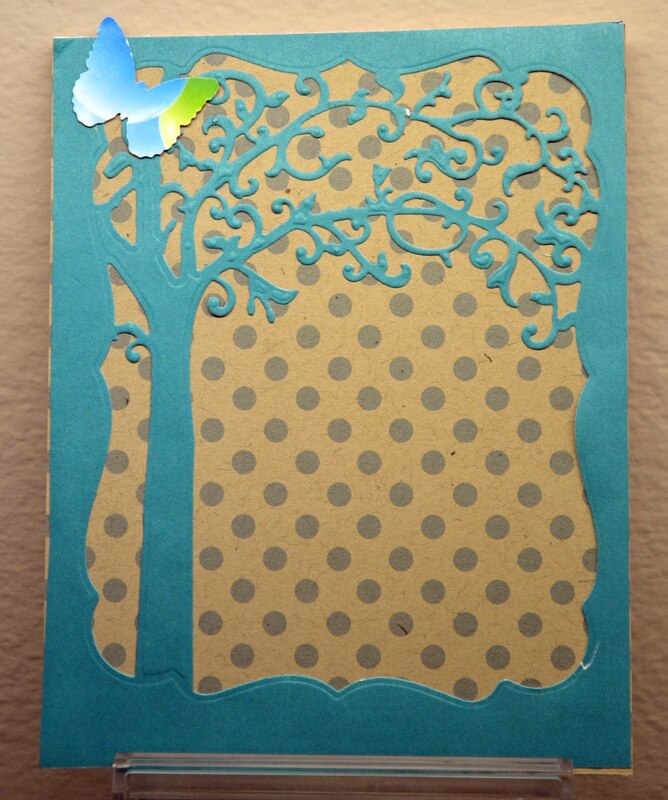 (The dots embossing folder is from Cuttlebug/Provo. The chevron ribbon is also by Close to My Heart (attached using Therm O Web’s Super Tape); the die is Spellbinders Labels 8, raised on foam squares. I have other variations … I’ll save those for a rainy (read lazy!) day! 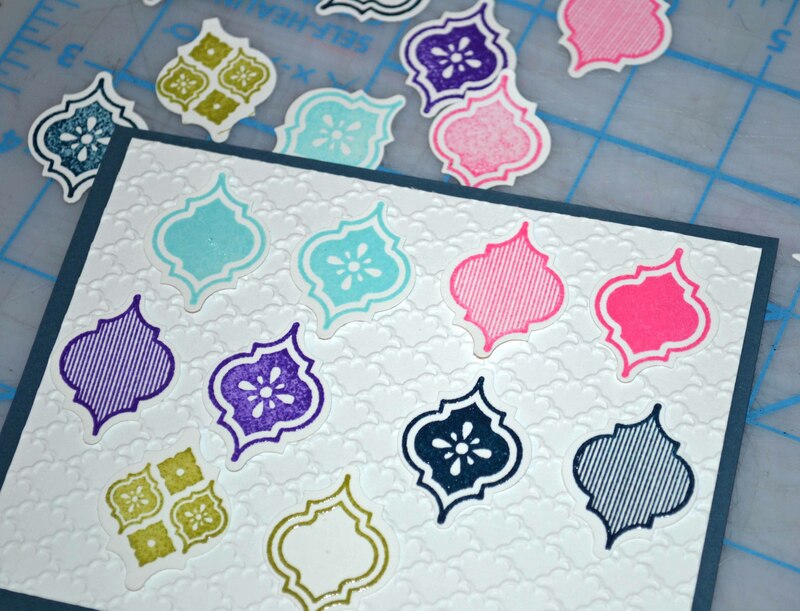 We all know how impatient I am, so as soon as the stamps arrived I immediately began randomly stamping images using yummy new pigment inks from Colorbox and embossing them in clear powder. But here’s the BEST part — I didn’t have to cut them out individually! I used the matching punch! So cool. So easy. So fast. Then I heard my neon inks (all Hero Arts) screaming out, “stamp me! stamp me!” So I did. 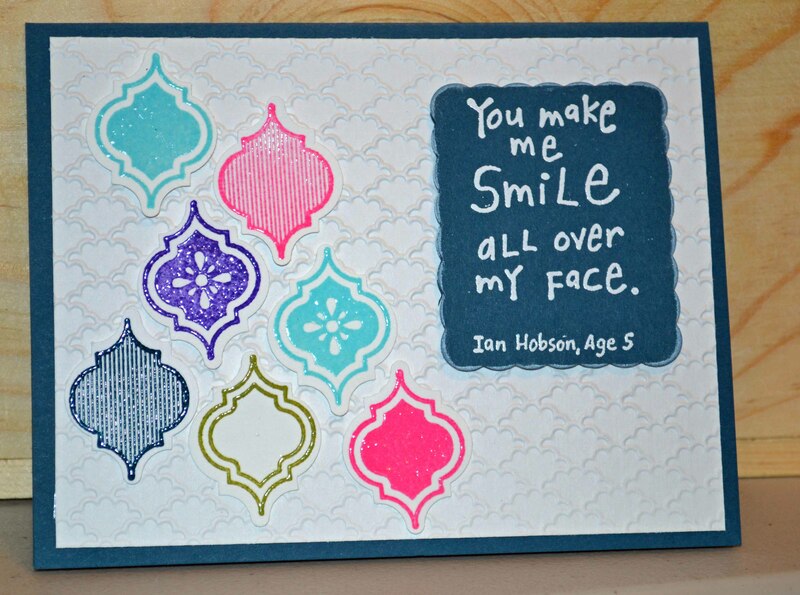 Now I need to go back and do more thoughtful stamping using these images. It took me a while to get on the rosette bandwagon, but now that I am, I am crazy about them. Big ones, small ones, fancy ones, plain ones. Love me some rosettes! 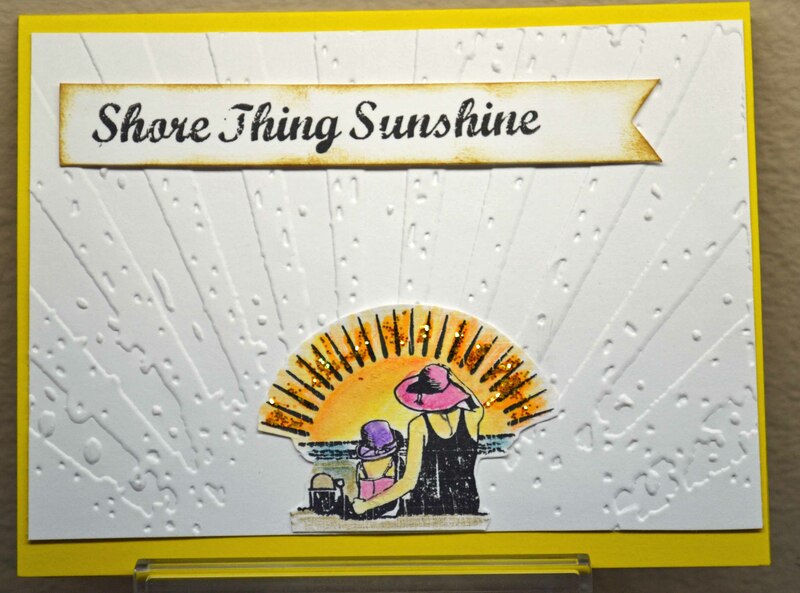 I used to make them using my Stampin’ Up scoring board (a valuable tool and a Fabulous Find), which I thought was pretty easy. Well, it IS easy to use. But my wrists got tired after scoring too much. Anyway, I finally decided to put them to use. 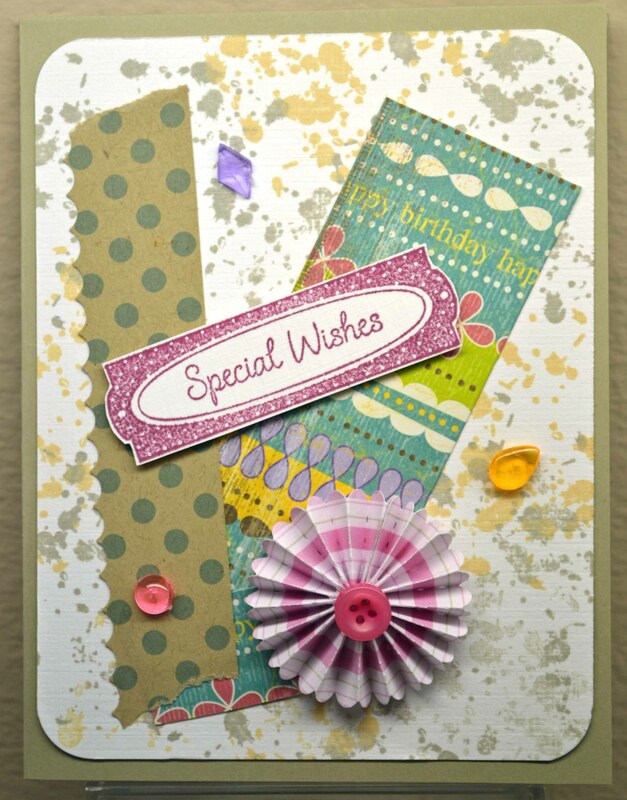 This double-sided cardstock from K and Company made it easy to create a simple birthday card. 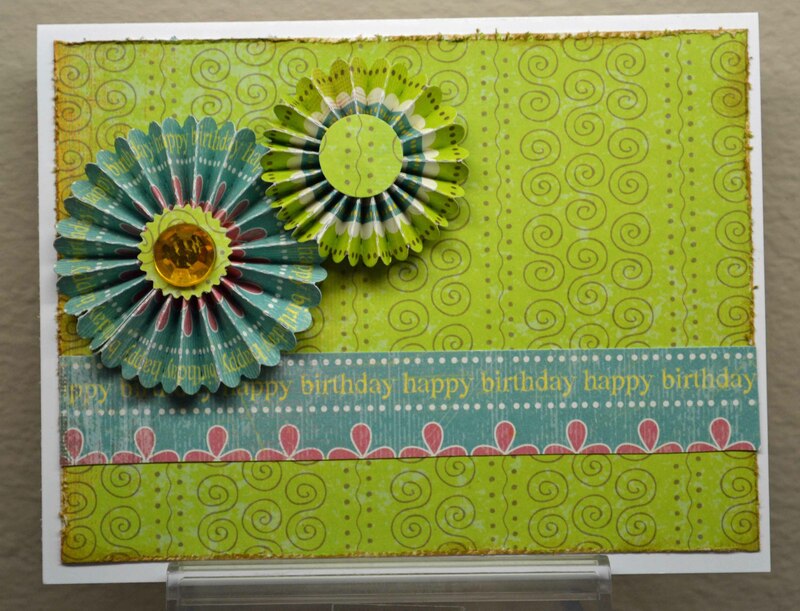 I cut some strips to make the rosettes, then used the rest to make the card front (I chose the plain side so the rosettes wouldn’t have to compete with the pattern. 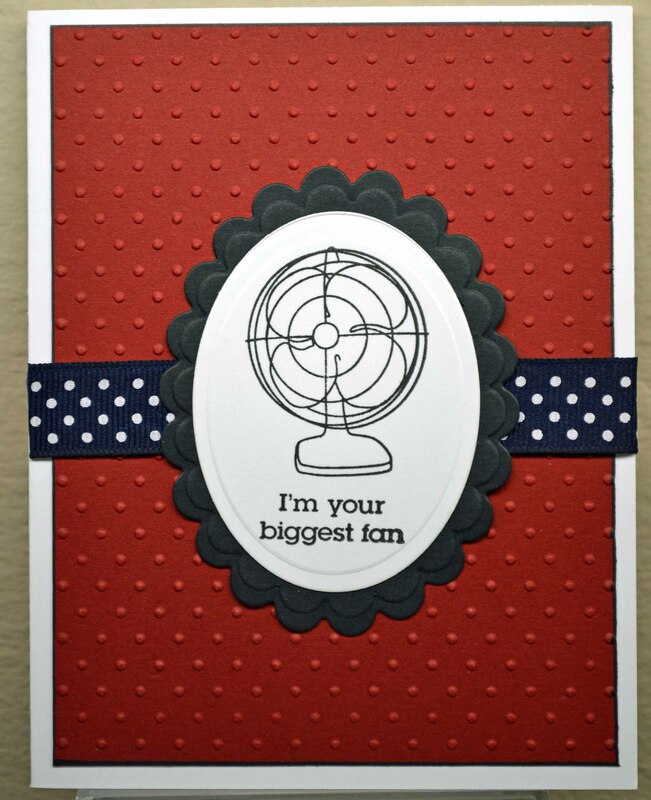 I thought of adding a sentiment, but I thought the piece cut from the other side of the cardstock was enough. Is it? Now, of course, I want the bigger rosette die, too!!! Here’s a quick tip: Tim has a great rosette tutorial on his website. 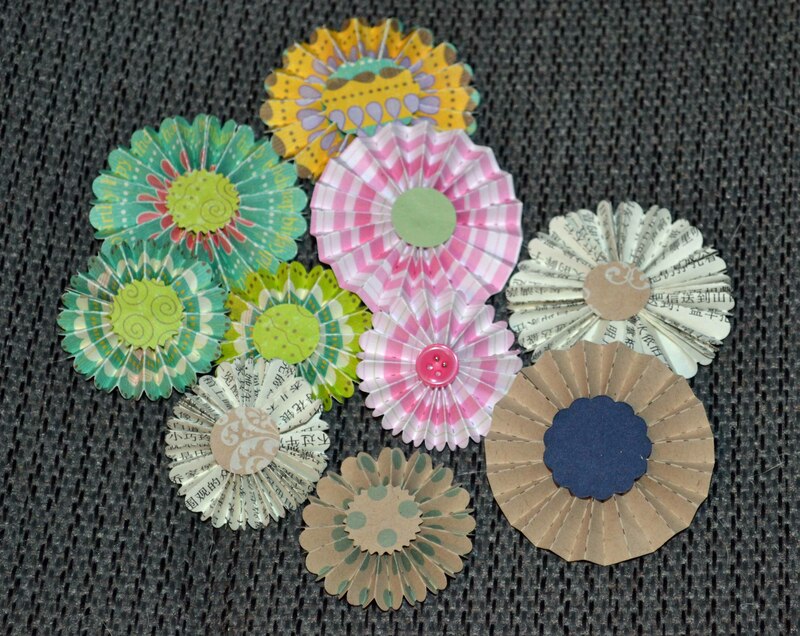 He also notes that if your rosettes tear at the score line, simply add a piece of tissue tape to the back for added strength. I did not have a problem with the rosettes tearing, so didn’t do that, but it’s good to know, eh?